ANSI/BHMA A156.12 Grade 2 & UL Listed 3 hours fire rating interconnected leverset series. Applications for offices, schools, hospitals, apartments, hotel/motel and other public building. Door Thickness: 35mm (1-3/8")~45mm(1-3/4") available. 4" center of deadbolt to center of lock chassis. Exposed Trim: Wrought brass or stainless steel. Pressure cast zinc lever. Lock Chassis: Heavy gauge dichromated steel with black powder metallurgy cylinder housing. Cylinder: KIK cylinder, Rim 35 cylinder. 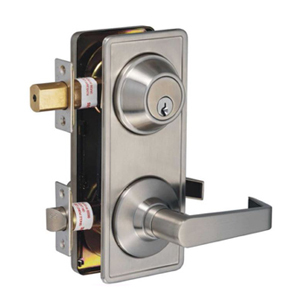 Deadbolt: 1.25.4mm (1") throw with hardened steel rod insert. 2.Backset 60mm (2-3/8") or 70mm (2-3/4") adjustable. Latch Bolt: 1.12.7mm (1/2") throw stainless steel latch bolt. 2.Backset 70mm x 28mm x 51mm (2-3/4" x 1-1/8" x 2-1/4") faceplate mortise latch. Strike: 2-3/4" x 1-1/8" x 3/32" standard.